It can’t be already the beginning of March and I find myself still catching up with things like this Italian Vegan Apple Cake. This is a cake that I have had on my mind to share here since the beginning of winter. It is a cake that is baked very often. 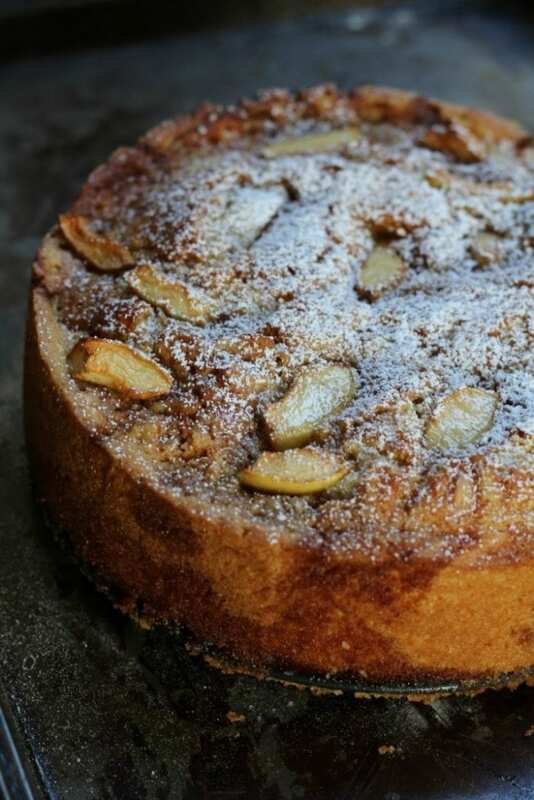 This apple cake brings comfort and joy each time it is baked. It is so simple to put together and it is a vegan riff on a one of the first cakes my mother-in-law Teresa taught me when we first met. I ended up doing a vegan version back when my neighbors were vegan and I thought it would be fine to experiment in baking. I read every book that was out there on being vegan and vegan food and tried out so many things! I think I even was vegan for almost a year! That’s a long time when you’re in a big Italian family. I swear I thought my Italian family was the biggest one on the planet until I met my husband’s family. And you know when you are in an Italian family, there is always cheese being brought home from so and so to try. Or, hey! Aldo made this capicolla or this lardo (that’s pure lard) and it’s so good you have to try it! So my attempt at being vegan for a whole year was a noble attempt with some blips along the way. But I did learn during that time that I already was vegan most of the year, I just learned some new baking recipes that eliminated eggs and dairy, and they were all so good! So back to Teresa-she really is quite a baker and she is famous in the family for her cakes, especially her apple cake. It’s kind of a staple when you visit her. 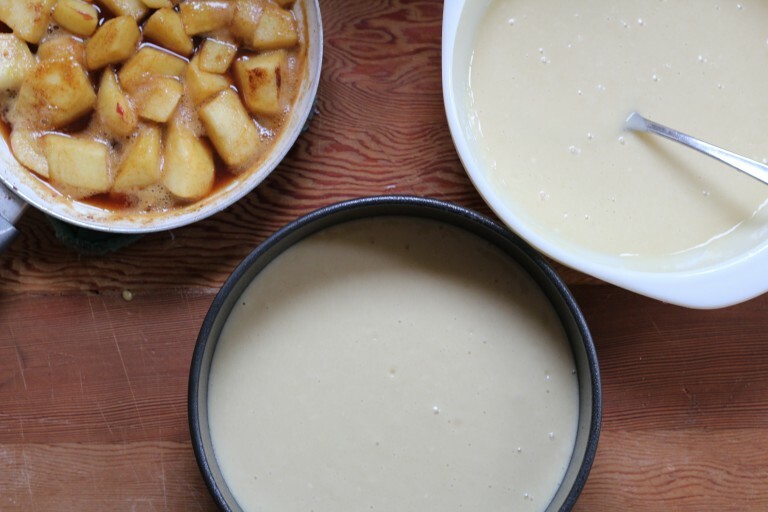 You get to try her apple cake or any other cake made with her various homemade jams (jams made with berries that they grew or other fruit that some friends grew and shared with them. That’s life in Italy). I did make this recipe and changed just a few things. I reduced the sugar and the oil. The apples made the cake so very sweet (at least for our taste). And as for the eggs, you could easily make your own flax eggs: For each egg, combine 1 tablespoon of ground flax seed (measure after grinding) with 3 tablespoons of water. Stir well, and place in the fridge to set for 15 minutes. I always have whole or ground flax seeds around, so it’s easy to put together. The cake is lovely baked in a 9-inch round cake pan or a tube pan. Just take care when you remove the cake from the pan. Be sure to let it cool very well or you will burn your fingers as I have rushing to get it ready for that first slice for my taste testers. 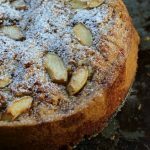 Italian Vegan Apple Cake, this is a delicious, egg-less and dairy free cake. 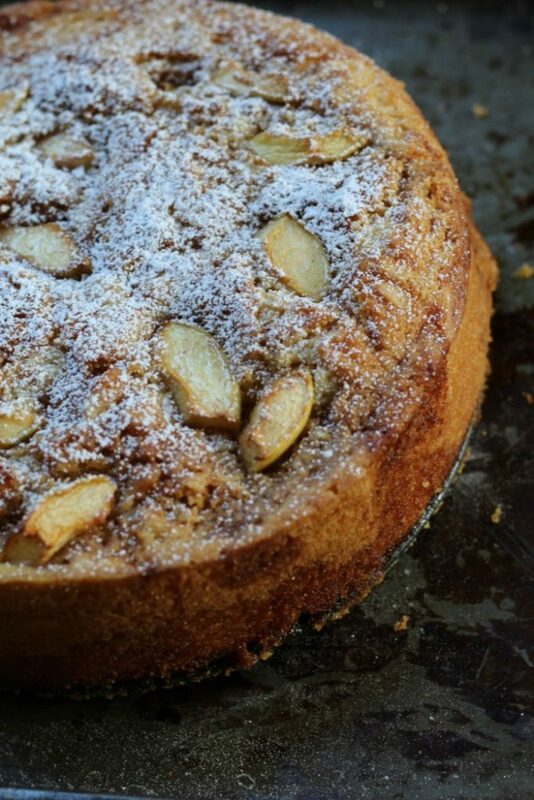 I put a vegan spin on my Italian mother-in-law's famous apple cake and it so soft and moist! Preheat oven to 350 F. Spray a 9-inch baking pan with baking spray. 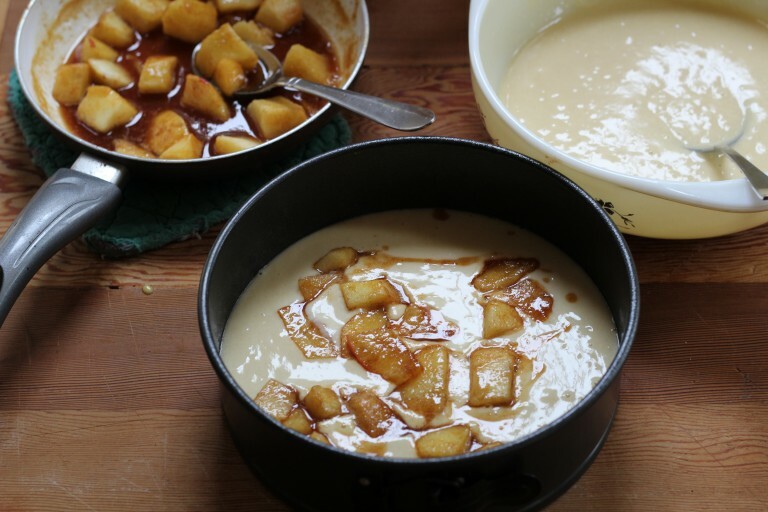 Place the apple chunks in a large bowl. Add the lemon rind, light brown sugar, cinnamon, and ginger and stir together. * I used a spoonful of Teresa’s ground Calabrese lemons from her limoncello production. It’s a magical little jar of ground lemons rinds soaked in vodka. In a small bowl, add the coconut milk and apple cider vinegar. Mix together and let sit while you prep the other ingredients. In another large bowl, sift together the flour, baking powder, and sea salt. Add the flax eggs, oil, sugar, and vanilla to the coconut milk/apple cider mixture and stir together until all combined. Bake for about 40-50 minutes or until a skewer inserted in the middle comes out clean. Depending on the oven, I always check the cake after 30 minutes and lower the heat to 325 for the remainder of the baking time (that’s because of my oven).